We’ve known for quite some time that the effects of global warming could be catastrophic, but a new study suggests that the Great Barrier Reef may never recover from the changes to the environment. The study regarding the effects of global warming and the damaging effects it has had on the Great Barrier Reef was published in the journal Nature, and within, Hughes and his colleagues lay out just how dire the situation is for one of the world’s most precious natural wonders. According to the research team, about 30 percent of the Great Barrier Reef corals were lost in 2016 alone, and they suspect that another 20 percent of corals were destroyed during a second heat wave in 2017. It’s clear that the Great Barrier reef has taken a huge hit as the result of global warming, and while we can take steps to slow down the issue it’s unlikely that the reef will ever be back to its former glory. What surprised scientists about these findings was that coral on the Great Barrier Reef were feeling the effects of global warming to a further extent than expected, dying faster and at lower levels of sustained heat than the researchers had expected. Some coral was hit harder than others, with the elaborate branching corals that make up a large portion of the local fish habitats being replaced by smaller and less visually impressive dome-shaped coral. While there’s always the possibility that the ecosystem will bounce back, it’s important to keep in mind that it will take around 10 years of vastly improved conditions for even the fastest growing corals to bounce back, and considering the ramp up we’ve seen of destruction due to global warming, the chances of our species making a significant change that can help stave off this destruction quickly and efficiently is probably pretty low. The Coral reef isn’t currently on the brink of destruction, but it will start shifting to a collection of less diverse and more resilient coral. This will likely have a marked effect on the vast number of aquatic species that call the Great Barrier Reef home – driving home the fact that the destruction of habitats can cause the destruction of unique and beautiful species as well. The death of so many corals in both 2016 and 2017 happened as the Great Barrier Reef struggled to weather the effects of global warming – dealing with two successive summers that were much warmer than anticipated, causing ocean temperatures to rise and the sensitive ecosystem to start taking damage. These incredibly high temperatures cause a situation known as “bleaching” in which the algae that give the coral their vibrant color start to abandon the area. While a change in color on the Great Barrier Reef due to global warming might not seem that significant, that’s far from the only effect that this disaster is causing for this vibrant ecosystem. 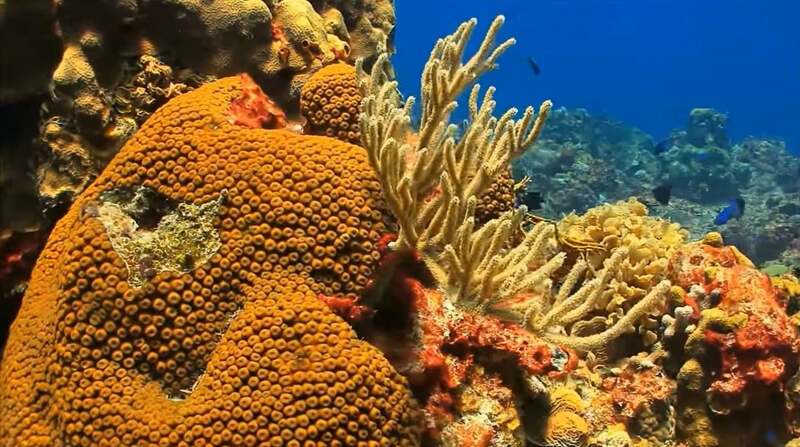 Coral and these zooxanthellae algae have a symbiotic relationship in which the algae carry out the photosynthesis necessary for the coral to survive. With the absence of the zooxanthellae comes an absence of life for this important part of sustaining the Great Barrier Reef ecosystem. The destruction of the Great Barrier Reef due to global warming is worth taking note of, but the reef may survive to see another day. However, it may never have the same sort of diversity that made it so exceptional.